The Highland Folk Museum, Britain’s first open air museum, has many fascinating stories to tell. As visitors explore the 30 buildings they get a flavour of how Highland people lived and worked from the 1700s up until the 1960s. Now visitors can also join Alan Crawford and listen to his story ‘In the Land of the Glittering Wood Moss’ and go on a magical journey into the past to discover why Scottish ancient woodland is so special. Each chapter of the story is played automatically to visitors mobile devices as they move through the 1 mile site. The story is delivered using Audio Trails’ GPS Tour Guide app software for iOS and Android, which focusses purely on the delivery of audio. Accordingly, visitors don’t even need to take their device out of their pocket or bag to use it! With no screen distractions, visitors can breathe in the scene around them and listen to Alan’s enchanting story. 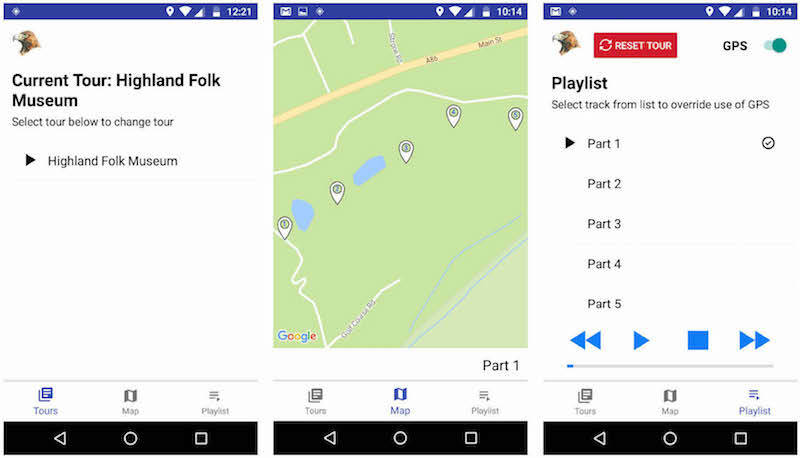 The simple three page app (two pages for tablets) allows visitors to select the tour, view the audio stops on a map and view the audio trail playlist. This GPS Tour Guide app software is also used by coach, bus, boat and train operators, including the New Forest National Park Authority, to play GPS-triggered audio guides to tourists over their vehicles PA system. If you’d like to know more about our software please get in touch.